The Corfu International Airport, "Ioannis Kapodistrias", is located around three kilometres south of Corfu, just half a kilometre north of Pontikonisi. The airport accepts domestic flights, but the vast majority of traffic in the summer season is direct and charter flights. The majority of the traffic arrives on Mondays, Fridays and Saturdays mainly to coincide with the change-over days for holiday apartment rentals. Seaplanes, Air Sea Lines, a Greek seaplane operator, offers scheduled flights from Corfu to Paxoi, Lefkada, Ithaki, Kefalonia, Ioannina, Patras and Brindisi in Italy. Transfers to the conference site will be arranged from/to it. Your flight number and details will be requested in the registration form. Transfers will be by bus, minibus or taxi. 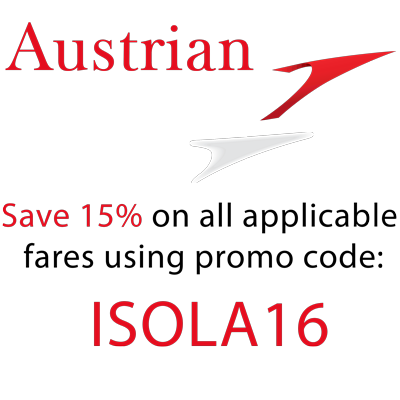 Book your flights to the 7th International Symposium on Leveraging Applications of Formal Methods, Verification and Validation online at www.austrian.com and save 15% on all applicable fares! Valid for flights to Athens via Vienna and return as of September 29, 2016 until October 21, 2016 (final date for return flight) on OS operated flights. Greece is part of the European Union and adheres to the Schengen Treaty. Please visit the site of the Greek Ministry of Foreign Affairs to find out whether a visa is required for your country, and how to obtain it. If you require an invitation letter (provided you are a registered and paid for participant) please contact info@easyconferences.eu. Participants may arrange for transfers by taxi through the conference coordinator, Easy Conferences. These transfers are bookable online through www.easyconferences.org. These transfers can be private (max 3 persons) or shared, are inclusive of meet and assist at the airport, travel by luxurious Mercedes cars, and service is guaranteed. Participants can get an airport taxi on arrival to the airport. Service is quite good, but at times one may have to wait and prices may vary depending on the time of arrival. A list of all buses around Corfu, can be found below. The buses are separated by city while route details, timetables and maps are available for the routes. Blue buses run routes close to Corfu town, up to Benitses- south- and Dassia -north. The current timetable is available at the official Blue Bus Website, available in various languages. You can download a useful leaflet, providing a small map and the bus routes. Also, a full bus schedule is available here. In both cases, you will see that there are limited or no routes on Sunday.